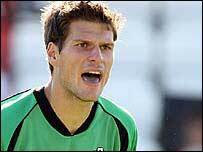 Yeovil Town chief executive Martyn Starnes has confirmed that the club are keen to sign goalkeeper Asmir Begovic on loan from Portsmouth. The Glovers are without a senior keeper after Steve Mildenhall joined Southend. And Begovic spent a successful loan spell at Huish Park last season when Mildenhall was injured. Starnes told BBC Somerset: "We are interested in getting Asmir back and our manager Russell Slade has spoken to Harry Redknapp about him." He added: "It's no secret that we were very impressed with Asmir when he was here last season but we might have to be patient if we want to get him back. "Typically with these loans it can be quite late in the day before decisions are made because Premiership clubs need to finalise their squads first." If we can't keep hold of a player who lives down here and actually wants to stay, then we'll never persuade a player from elsewhere to join us. Starnes has also hit back at claims from Mildenhall that Yeovil is a complacent club. "We don't lack ambition at all at this football club but we have to pursue success realistically and based on what we can afford. "We are confident that we can take this club forward but we have to be prudent. "We made Steve an extremely good offer but if he can get a better offer elsewhere then good luck to him. Football is a short career. There are teams in this division that can afford to pay more than us." Starnes also confirmed that manager Russell Slade's playing budget has been cut for the coming season. "We have had to be careful with the provisional budget that's been given to Russell. It is smaller than last season but there may be scope to increase it if we have a successful season. "It's difficult in the current economic climate to know what our income levels will be so we have to be cautious."